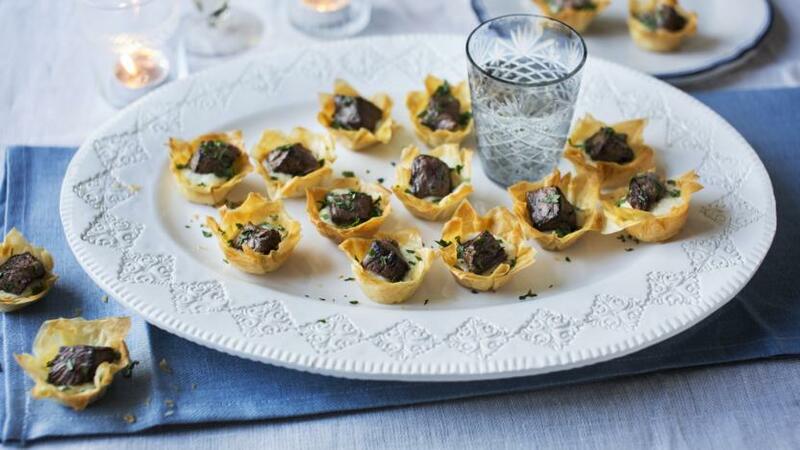 Mary Berry's miniature beef-and-horseradish tartlets are perfect as Christmas party canapés. Equipment and preparation: for this recipe you will need a 24-hole mini muffin tin or two 12-hole ones. Each serving provides 35kcal, 1.5g protein, 3g carbohydrate (of which 0.7g sugars), 2g fat (of which 0.8g saturates), 0.1g fibre and 0.1g salt. Brush both sheets of the filo pastry all over with the melted butter, then place them side by side. Using a 5cm/2in square pastry cutter, or a sharp knife, cut 25 squares from each sheet of pastry (there should be exactly the right amount of pastry to yield 50 squares with no trimmings). Take one pastry square and place another on top of it, turning the top layer at an angle to create a star shape. Repeat this process with all of the pastry squares to create 25 stars. Bake the tartlet cases in the oven for 5-10 minutes, or until golden-brown and crisp. Remove from the oven and carefully transfer to a wire rack to cool completely. In a bowl, season the fillet steak cubes with salt and freshly ground black pepper, then drizzle over the honey and mix well to cover the meat. Heat the oil in a frying pan over a very high heat, then fry the steak for 1-2 minutes on all sides, or until browned all over but still pink in the middle. Transfer to a plate and set aside to rest for a minute or two. Spoon small, equally-sized dollops of the horseradish into the cooled pastry cases, then sit one warm cube of fillet steak on top of each. Sprinkle each tartlet with a pinch of chopped parsley just before serving. The tartlet cases can be made up to 1 day in advance, then filled on the day.